Rinse the crabs and then pat them dry. In a large sauté pan over medium-high heat, heat the olive oil and garlic. Sauté the crabs until the meat turns pale white and its partially cooked, and the claws begin to turn reddish orange, about 8 to 10 minutes. Heat the marinara sauce in a large saucepan. Stir 1 tablespoon of the olive oil from the sauté pan into the marina sauce, then place the crabs in the sauce and simmer for 20 minutes. Meanwhile, boil water for the pasta and cook the linguine to al dente. When the sauce is ready remove the crabs and toss the linguine with the sauce and the parsley. 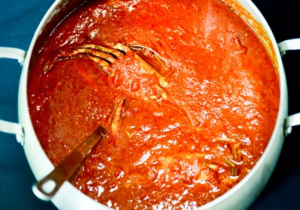 Serve the crabs, whole or cut in half, on top of the pasta.